From weddings to athletic events and concerts, we’ve been a part of hundreds of events and helped users share thousands of photos without a single text, email or upload. We're changing the way the world shares memories. 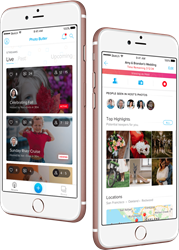 Photo Butler is a free mobile app for collaborative, real-time photo sharing that’s changing the way the world shares memories. From weddings, athletic events and concerts to everyday moments, Photo Butler allows you to be fully present and free of distraction while creating and sharing living albums. Learn more and enhance your event with Photo Butler at http://www.photobutler.com.